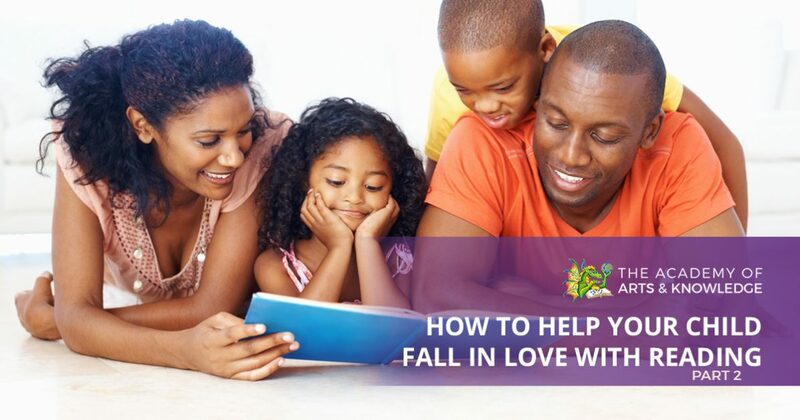 In an earlier blog entry, we discussed a few simple steps that you can take to help foster a love of reading in your child. Today, we will continue this series with a few more tips that are easy to implement and that will have a long-lasting effect. If you are looking for an elementary charter school that builds its curriculum around the arts, be sure to check out The Academy of Arts & Knowledge in Fort Collins. We adhere to all state standards, and we believe that teaching with the help of the arts is an effective and valuable way to educate children. Contact us today or visit our website for more information about our school or to learn about upcoming application deadlines. We touched on this idea a bit in our last blog, but we thought it was important enough to cover in more depth today. Children tend to mirror their parent’s behavior, even if they don’t at first understand why. Mimicry is an important part of learning many important skills, including speech, eating right, and looking both ways before crossing a street. One of the best indicators of whether or not a child enjoys reading is whether or not their parents are readers. If a parent spends a lot of time looking at their smartphone, tablet, or another screen, their child will probably imitate that behavior. The overwhelming amount of stimulus that a screen can give is hard to compete with, so it is important to teach children that there are other ways of entertaining oneself and learning. So, the next time you are thinking about picking up your tablet to check out a news site, grab a book, magazine, or newspaper instead. You might notice that your child will join you with a book of their own. If they do, ask them about it. Find out what they like about it. Ask them if they would have told the story differently. Showing your child that there are many ways to engage with a text that goes far beyond the ink on the paper is an excellent way to help them see just how fun reading can be. This seems like an obvious choice but many people don’t realize that they may be trying to force books on their kids that the child isn’t that interested in. If you have heard yourself say, “I loved this book when I was your age,” it might be a good idea to stop and see if it is the kind of book or story that your child is generally interested in. If it isn’t, ask them what they want to read. While you might be champing at the bit to share your favorite books with your kids, the time might not be right. Hold off and wait until they ask you about it or they become interested in your favorite genre. If your child has struggled with reading, it is important to let them know how proud you are that they are trying to improve their skills or whenever they haven’t given up on a book. While we don’t think it is necessary to give them anything, telling them that you are glad to see them reading can mean a lot. Let them know that you appreciate their hard work and that it will get easier if they keep at it. If you are looking for an arts-centric charter school for elementary-aged kids in Fort Collins, The Academy of Arts & Knowledge is an excellent option! Contact us today to learn more about our application period.